cons: Hard to find in stores, very floppy so it requires interfacing, shows seams. pros: Very cuddly, doesn't need interfacing to hold shape, seams barely show at all, good for big plushies. cons: Can be expensive, usually less colors available, slightly more difficult to work with. If you're using felt, fleece or minky, I strongly recommend you use iron-on interfacing. This is a thin material which keeps the fabric from flopping around and stretching, which can make it hard to sew and distort the pattern. Interfacing also makes it much easier to trace the pattern onto the fabric. Cut the interfacing to fit and place it on the back of the fabric, rough-side down. The roughness is a heat-activated glue which melts when you iron it and adheres the interfacing to the fabric. Follow the instructions that come with the interfacing. You'll also want to decide how you're going to finish your pony's mane & tail and facial features. Some choices for eyes and cutie marks are: iron-ons, embroidery, plastic safety eyes, felt, fabric paint. 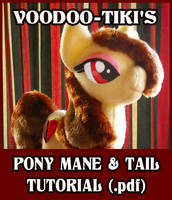 For mane, you can use yarn, embroidery floss, sewn shapes, cut felt or faux fur. I've included a generic tail pattern as a guideline, but there are so many different manes you are best off designing your own. Print out the pattern onto card stock, or trace onto cardstock or light cardboard (poster board, manila envelopes, or cereal boxes work fine). Transfer the lettered/numbered marks if you're tracing. The pattern will print out on two 8.5 x 11 inch sheets, but you can shrink or enlarge it. Carefully trace the pattern pieces onto the back, or "wrong" side of the fabric. With minky or fur this is the non-furry side, with fleece it's the less smooth side. Don't forget the alignment markings. Leave at least a half inch (1.25 cm) between pieces. I use indelible marker, but you can also use special erasable markers. Minky and fur fabric has a "nap", which means the hairs point in one direction just like the fur of a real animal. Run your hand over the fabric, it will be smooth in one direction, rough in the other. Mark a small arrow in the smooth direction on the wrong side to remind you. Arrows on the pattern pieces show how to turn the piece so the fur is running in the correct direction. You don't have to bother with this if you use fleece, felt, or a fabric without a nap. Some of the pattern pieces are marked, "2, 1 rev.". This means you need to flip over the piece and cut out two mirror images (this will be the left and right side). Make sure you draw the alignment markings on both sides! Carefully cut out the pieces around the lines you drew - leave about 1/4 inch (2cm) of space around the piece. This is called the "seam allowance". If you're using faux fur, take very small snips so you don't cut the actual fur. On the underbody, don't cut out the turning opening (the diamond shape) or the leg gussets (the round shapes in the "armpit" area of the legs). You should have two bodies, two side heads (both mirrored), four hooves, one underbody and one center head. If you're making a faux fur mane and tail, cut the tail out as well. Cut off sharp corners (like at the bottom of the leg). Most people pin pattern pieces together, but I prefer tacking. Holding the fabric pieces together, take a single stitch through the fabric and back again, and tie a knot. Do this at all the major alignment marks, and at sharp corners (like where the legs come out from the body). It takes longer but I find it much easier and less frustrating. If you're hand-sewing, use a BACKSTITCH. Starting with the face, put the two pieces with the outer, or "right" sides of the fabric together (RST = right sides together). Tack and sew from E1 to C1. RST, sew the body pieces from C2 to D1 if you're using the faux fur tail. If not, sew from C2 to E6. Matching up B1, B2 and B3 on the head and body pieces, sew first one head to the body, B1 to B3, then the other. Tack the center head between the open part of the upper head/body. Match C1, B1 and C2 and the shapes of the ears. Go slowly and take care. Sew around the center head starting at C1 (the tip of the muzzle), going up the head to B1, around the ears, and down the back of the head to C2, then repeat for the other side. Next, we'll work on the underbody. Take a hoof and tack it to the bottom of the underbody's front leg, matching the little alignment marks on the hoof to E2 and E3 on the leg. RST sew along half the diameter of the hoof, E2 to E3. Repeat for the other front leg, and then for the back legs E4 to E5. Tack the underbody to the upper body, matching E1 under the chin, E6 under the tail. Tack at the alignment marks and where indicated by a red X in the photo. Sew from E1 to E2, finishing off the rest of the hoof from E2 to E3, and continue on. until the underbody is entirely sew to the upper body. Now carefully cut out the diamond shape on the underside - this is the turning opening. Don't turn it just yet, though. First we have to sew the darts, which are the circles under the legs. Darts will keep your pony standing up instead of sprawling. Pinch up the fabric, folding along the dotted spoke in the center of the dart, so the rims of the dart touch (a bit like folding up a taco shell). Sew along the rims, then cut out the excess material inside. Repeat for the other legs. Carefully turn the body right side out, starting with the head. If you have troubles, don't force the fabric as this can make fleece or felt pull and show the seams. To help with difficult corners like the edges of the hooves or the muzzle, use the eraser end of a pencil or a similar blunt-tipped implement (I use a repurposed kabob skewer). Don't jab, or you may rip a seam open. Take a few stitches across the base of the ear to keep stuffing from getting up in there, otherwise your pony will look like she has horns. At this stage it's very tempting to cram stuffing in as fast as possible to see how your pony looks. RESIST THE TEMPTATION. Stuff slowly, using small pieces, or your pony will look lumpy and lopsided. Use the eraser end of a pencil, the handle of a wooden spoon, or a similar blunt implement to make sure you fill out all the little corners and narrow spots. Stop and check often to make sure the firmness is even. Take particular care with the head, since this is where people will focus first. Stuff the head and legs firmly, and the body slightly less firmly. For the finishing seam, I use a curved needle, but you can use a regular one, too. Make a small knot on the inside of the fabric at the chest, and LADDER STITCH the opening closed. If the stuffing is interfering with your stitches you've probably filled the body too fully. A small piece of felt inside the body can also keep stuffing from tangling in your thread. If you're using the faux fur tail, RST sew it the long way round from A1, D2-D1, to A2, leaving it open between A1 and A2. Turn through the opening, and ladder stitch it closed. Tack it to the body matching D1 and D2, and ladder stitch to the body. And now you're done, except for the finishing details! By request, this is the text-only version of the tutorial for translations. If you do a translation, please leave a comment and link on this or the photo tutorial page! How big is the plush without enlarging it? Thanks! Finally I've found someone who has plushie patterns! Most good plushie makers don't allow other people to use their custom patterns but now I can finally figure out how to make my own plushie! You can, but it's not really a great idea since the beans will decay over time, might attract insects, and will rot if they get wet. If you can't find beans, to weight the legs you can use little bags of decorator's sand. How many yards of fabric do you recommend I buy? It depends on how big of a plush you're making. At printout size, you only need 1/3 yard. Question, if I wanted to make it life size, what would you recommend as a "Skeleton" to allow it to be posed? Hm, how big do you consider lifesized? Usually a wire skeleton will suffice, but a REALLY big one might need something more like a sawhorse inside her. about 3 1\2-4' is good, not looking for Truly "Life-sized"
I am currently attempting to make a pony from your Pattern. However I am haveing some trouble with the head. Can I send you picts when I get it done. I was wondering if you had more in depth directions for people who need hands on instuction. Sure, I am not the best at explaining things but I'll do what I can to help. Thanks for the help. I already made one pony from your paterns and instruction. Lets just say i call her franken pony. I will use her for a model of what not todo. Anyhow the problem i have with hoof is when I sew it theres alot f extra overhang. am I supposed to sew the round hook to the inside or outside. I was looking at your instruction picture and Cause it is smaller picture I cant make out how you are doing it. Thanks for your help. this pattern makes a cute pony If I can just make one that looks like yours. It keeps the hook from bulging out. Thank you so much for making this pattern. Thank you so much for making this pattern available! I have one question about the seam allowances. Should we measure out from the edge of the pattern piece, or measure in? Thank you! Re-reading the directions this morning (instead of late at night) I saw that you clearly said that. Sorry. I found this very helpful! Thanks for posting it! 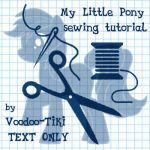 I love your pattern, and will probably use it for my pony plushies! Thanks a ton! A single stitch is fine unless you think the plush is going to be handled roughly (like if it will be given to a small child). I usually reinforce under the legs just to be safe.